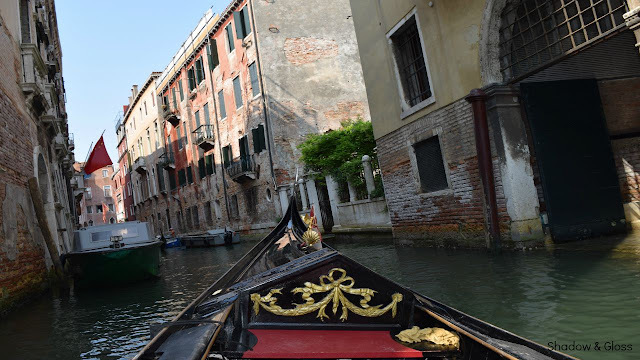 Today's travel guide is on the one and only Venice, Italy. if you follow me on Twitter you would have known I just got back from Italy. Although I have been to Italy 10+ times, I have only been to Venice once before, when I was really really little, so I didn't remember anything. We were there for 2 and a half days! Because most of what we did was walking around and visiting churches and everything in the guidebooks, I'll tell you the highlights and the places I ate. I wouldn't go to Venice for the food unless you are willing to spend a lot of money! We did eat at a couple of restaurants that stood out and didn't cost an arm and a leg. The first being Bar verde. I stayed at the Danieli hotel, and this bar was right around the corner. They had really good sandwiches, tiramisu and fruit tartes. I recommend eating at the bar (or standing up) if you are looking to save some money. Ristorante Marco Polo was surprisingly good! I had an AMAZING branzino. Others at the table were had the pizza (which was really really good) and pasta, also good. The last place I want to recommend is my favorite. Its called Al parlamento. This is the restaurant that all the local venetians come to. They have the best panini I have ever had and it’s a quiet restaurant. I went there for both lunches i was in venice for and it was incredible. I HIGHLY recommend this place! Those are all my food recommendations for Venice. Overall I had a nice experience in Venice. Let me know your favorite places to eat in Venice!